I know now that the word avuncular means with uncle-like affection, but for some time I based my understanding of the word solely on the sound of it, which shared both the soft and fevery V sound of viral and the general quarantine-ward feel of tubercular, e.g., “I’d stay clear of that guy. The chronic, rasping cough, the clammy skin, the bloodshot eyes. He’s gotta be avuncular.” The initial misconception never entirely disappeared, and to this day my perception of avuncular contains traces of my original misunderstanding. I realized this when avuncular was the first word that came to my mind when I looked at this 1978 baseball card depicting a friendly, uncle-like, faintly unseemly, and perhaps slightly contagious Stan Bahnsen. Stan Bahnsen had a 133 and 135 won-loss record at the time of this strange photo, which seems to me, based on the slope of his shoulders and the unusually relaxed, familiar expression on his face, to have been taken by Stan Bahnsen, his unseen arms outstretched and pointing a camera back at himself. 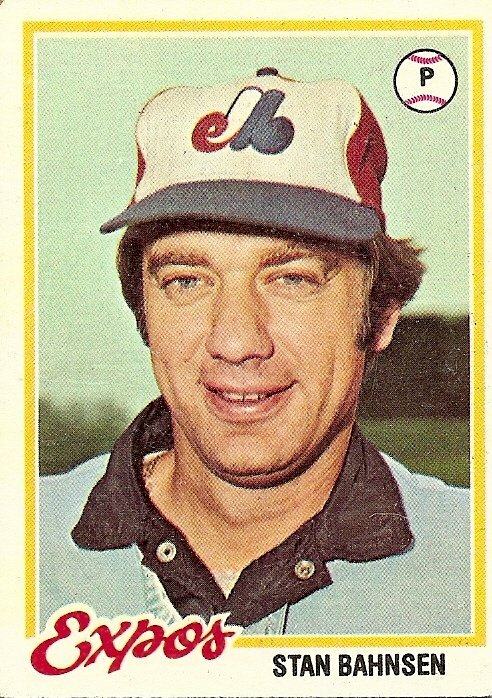 I can’t explain the blurry and bizarrely uneven background in the picture, but perhaps it is a hurried doctoring job by Topps, commissioned at the very last minute to cover up the original backdrop of the picture, which I can only infer from the leering undercurrent in Stan Bahnsen’s grin to be lowlit, illicit, boozy, malarial, the kind of faroff place where an aging avuncular hurler in a marshmallow-pale Expos cap might go to enjoy a stage show involving the ejection of ping pong balls from groin-related orifices. You are currently browsing the archives for the Stan Bahnsen category.